LAS VEGAS, Nevada, January 3, 2014 (ENS) – The International CES, formerly known as the Consumer Electronics Show and held annually in Las Vegas in early January, never used to be about automobiles. Instead, it was solely about electronic devices – TVs, computers, game boxes, home theaters and sound systems. But not this year. 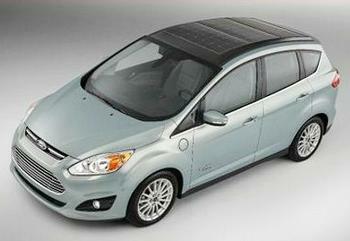 Ford is showing the C-MAX Solar Energi Concept, a first-of-its-kind solar-powered vehicle, at the 2014 CES, which is opening to the public next Tuesday, with a press opening on Monday. Toyota has a new fuel cell car on view, and Audi is presenting a high-tech plug-in hybrid concept car. Ford’s C-MAX Solar Energi Concept is a collaborative project from the Detroit automaker, SunPower Corp. of San Jose, California and the Atlanta-based Georgia Institute of Technology. Instead of powering its battery from an electrical outlet, Ford C-MAX Solar Energi Concept tames the intense power of the Sun with a concentrator that acts like a magnifying glass, directing rays to solar panels on the vehicle’s roof. The result is a concept vehicle that takes what Ford calls “a day’s worth of sunlight” to deliver the same performance as the conventional C-MAX Energi plug-in hybrid, which draws its power from the electric grid. By tapping renewable solar energy with a rooftop solar panel system, C-MAX Solar Energi Concept is not dependent on the traditional electric grid for its battery power. Internal Ford data suggest the Sun could power up to 75 percent of all trips made by an average driver in a solar hybrid vehicle. This could be especially important in places where the electric grid is underdeveloped, unreliable or expensive to use. In addition to its solar panels, the vehicle has a charge port and can be charged by connecting to a charging station via cord and plug. But by using renewable power, Ford C-MAX Solar Energi Concept is estimated to reduce the annual greenhouse gas emissions a typical owner would produce by four metric tons. With a full charge, the Ford C-MAX Solar Energi Concept has the same total range as a conventional C-MAX Energi of up to 620 miles, including up to 21 electric-only miles. Ford C-MAX Energi gets a combined best miles per gallon equivalent in its class, with EPA-estimated 108 MPGe city and 92 MPGe highway, for a combined 100 MPGe. After the C-MAX Solar Energi Concept is shown at CES, Ford and Georgia Tech will begin testing the vehicle in numerous real-world scenarios. The outcome of those tests will help to determine if the concept is feasible as a production car. Competing for attention at the 2014 CES is Toyota Motor Sales, U.S.A., Inc., with the debut of the FCV, a fuel cell powered concept sedan. Toyota’s reveal will feature the North America debut of the concept vehicle as well as an introduction to the fuel cell “test mule,” which logged thousands of miles during rigorous quality and durability testing on U.S. roadways. Toyota’s news conference will be held Monday, at the Mandalay Bay Conference Center. In addition, show-goers can rest their weary feet in a self-driving car. Sponsored by Bosch, the new Driverless Car Experience TechZone will feature technologies that support the future of autonomous driving, including parking assist, collision avoidance and emergency braking. Rupert Stadler, chairman of the board of management of Audi AG, will deliver a Tech Titan keynote address on Monday evening. Stadler will discuss future innovation in the automotive industry and its direct impact on the consumer technology market. He is expected to focus on Audi’s initiatives in the fields of piloted driving, future mobility concepts and infotainment based upon comprehensive connectivity technologies. Audi is presenting a high-tech concept car at the 2014 CES. The Audi Sport quattro laserlight concept is a coupe that features plug-in hybrid drives, user control and display interfaces and high-tech lighting. Owned and produced by the Consumer Electronics Association, the 2014 CES will run January 7-10 at the Mandalay Bay in Las Vegas.